Archive for category: Wish You Were Here? You are here: Home » Wish You Were Here? 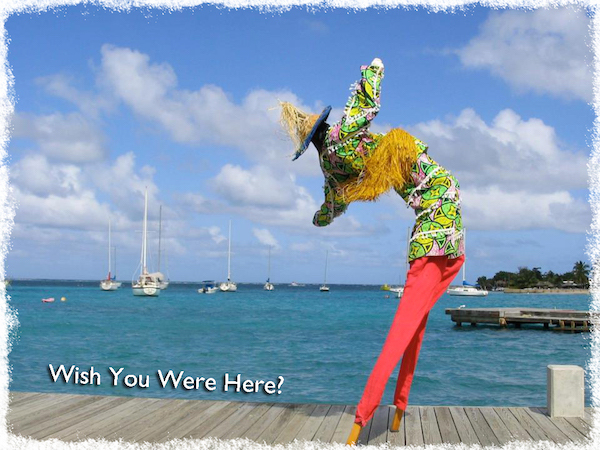 Wish You Were Here: Summer – Island Style! This year’s Annual Mango Melee and Tropical Fruit Festival is Sunday, July 12, 2015 at the St. George Village Botanical Garden. This popular summer event helps develop a greater appreciation for tropical fruits, especially mangoes, how to grow them and their many uses. Mango Melee offers educational workshops as well as fun activities for children and helps raise funds for the programs the garden presents throughout the year. With local vendors selling arts, agriculture and Crucian food – this event is a can’t-miss. Party in the streets of Christiansted! Music, dancing, food, drinks, street vendors and the iconic Mocko Jumbies all come together and Christiansted comes alive. On the night of Jump Up the streets, the boardwalk, and the restaurants of Christiansted are filled with people enjoying the sights and sounds, sipping local beverages and savoring the delicious food of St. Croix. This event only happens four times a year – don’t miss out on this favorite summer event! In July of every year, Crucians who live abroad, those who live right here and others who have found a home on St. Croix heed the call to Come Home to St. Croix. This annual weeklong celebration of St. Croix takes place at the historical Estate Whim Museum and includes presentations, workshops, cultural song and dance, and demonstrations. For a full schedule and details please visit www.stcroixlandmarks.org or call (340)722-0598. For the Love of Golf! Be sure to share your fun with us on our Facebook page! Remember only take photos and only leave footprints… Contact us if you need a ride! Memorial Day Fun on St. Croix! Clean off those grills, stock up on some hotdogs and sunscreen – Memorial Day is fast approaching! Whether you are a local gearing up for the long weekend or a visitor enjoying a relaxing break on our island, we hope you enjoy the official start of summer! The 2nd Annual Coconut Cup Festival is a three-day Stand Up Paddleboarding festival consisting of several WPA point races. You can register for the event at Paddleguru.com! Reef Jam if an annual music fundraiser at Rainbow Beach that features all local artists, guest speakers, community organizations, a Reeftivity Zone where children can play tons of fun reef-related games, and can learn how to snorkel, and of course tons of information about our reefs and why they are so important. Funds raised at the annual event are given back to the community in the form of Mini-Grants for projects that support the Reef Jam mission. Centerline would like to join in on the fun with our very first social media photo contest! Simply post a picture of how you are celebrating the Memorial Day weekend, tag any of our Centerline pages on Facebook, Twitter or Instagram and include the hashtag #MemorialDaySTX. Photos with the most likes will win a $25 gift certificate on your next rental with Centerline! Finally, as a closing, it is important to note that Memorial Day is much more than a sun-tanning, barbequing day off – it is a holiday to remember and honor those that have bravely fought and gave the ultimate sacrifice to protect our freedoms. In memory of many, in honor of all – we thank you. Wish You Were Here?| Fore the Love of Golf! Are you a golf enthusiast? Are you a beginner? Regardless of your ability, St. Croix has three amazing golf courses that will challenge your skills and leave you in awe of the beauty that surrounds them. String them together for a week of golfing and you’ll see three distinct areas of the island with a variety of views and unique highlights. The Carambola Golf and Country Club is a sprawling 18-hole course that is nestled around historic plantation ruins at the center of the Carambola Resort. The par-72 Carambola golf course was designed by world-renowned Robert Trent Jones Sr. and built by Laurence Rockefeller in 1966. Carambola’s golf course received a four star rating from GOLF Magazine and continues to be an attraction to visitors from all over the world. Three white sandy beaches border the Buccaneer Resort Golf Course. Rounds that last for less than four hours have the potential of lasting much longer as golfers get lost in the picturesque views at every turn. Bob Joyce designed this gorgeous 18-hole course in 1973 which gives players 5,668 yards of expansive green with a par-70 that is a perfect companion to the blues of the Caribbean Sea. With spectacular ocean views at thirteen of those holes, The Buccaneer is an ideal resort course. Challenging, yet very playable, the course is sure to delight golfers of all skill levels! St. Croix’s third course offers not only stunning views but the notoriety of being the easternmost golf course in the United States! The Reef is a 9-hole course set in the valley on beautiful Teague Bay on the northeastern part of St. Croix. This course, with 3,000 yards of fairways, groomed greens, and water hazards will challenge all levels of golfers. The Reef also offers a driving range and a fully stocked pro shop. When one thinks of active relaxation, golf should be at the forefront of those thoughts. Golf, with the added perks of island breezes and gorgeous scenery, is ideal. Whether you fancy lush tropical flora swaying before your eyes or tranquil blue water hypnotizing you, golfing on St. Croix should be top priority during your island adventure! While playing a round of golf, take a picture or two and share it with us on our Facebook page. The drive alone is a great introduction to the awesome views that Point Udall offers. Point Udall, St. Croix US Virgin Islands is the easternmost point in the United States and its territories by travel. Route 82 East takes you to this amazing lookout point. At the beginning of your journey to Point Udall, you are able to see Buck Island Reef National Monument in the distance on your left and rolling hills on the right. At the top of Point Udall is a sundial known as the Millennium Monument built for the New Year’s celebration in 2000 that was in commemoration of the first U.S. sunrise of the new millennium. Point Udall is named for Stewart Udall, former US Secretary of the Interior under presidents John F. Kennedy and Lyndon B. Johnson. After you get to Point Udall and hop out of your vehicle, the Caribbean Sea welcomes you with beautiful blue waters. Foamy waves crash against rugged rocks at the bottom of the hill. The beauty does not end with the views at Point Udall. A great hike down the hill will take you to Jack’s and Isaac’s Bay beaches where you can absorb your fair share of vitamin D while you lay in the soft sand. The path starts on the right side of the road just before you get to the Millennium Monument. The Nature Conservancy protects both beaches. The beaches are also turtle nesting sites, so remember to have fun and be careful especially during nesting season. Whether it’s to be the first in the U.S. to experience the rising sun, a day trip that includes a hike to gorgeous beaches, or a spontaneous mini photo-shoot with friends and family, Point Udall is an attraction that can be the beginning of many amazing memories. The perfect time to visit Point Udall is around New Years. Pencil in Point Udall on your itinerary to ensure a perfect getaway. What better way to ring in the New Year than to be that first person to witness the first U.S. sunrise of 2015? A big bonus is that on St. Croix the New Year is kicked off with many festivities like our Three Kings Day parades, food fairs and other events that will give you a taste of our delicious local flavor. Come join us and add to the flavor of St. Croix’s melting pot. When you get to Point Udall, take a picture or two and share it with us on our Facebook page. Remember take only photos and leave only footprints… Contact us if you need a ride! Wish You Were Here? We bet Dan Akroyd and Eddie Murphy do too! St. Croix has been the backdrop to quite a few movies, starting with “The Island of Dr. Moreau” filmed entirely on St. Croix in 1977. Fast-forward six years later and Hollywood’s great Dan Akroyd and Eddie Murphy filmed the closing scenes to the 1983 hit, “Trading Places.” You can find a list of movies and TV shows filmed in the US Virgin Islands by visiting the Department of Tourism Film Office. Today Davis Bay is where you will find the Marriott Renaissance Carambola Beach Resort and Spa, built in 1986. If you haven’t crossed this spot off on your Bucket List, it’s about time! Davis Bay is great for those seeking solitude and utter relaxation. Once you are on the beach there are no nearby roads with cars zooming by and the beach is not in the flight path for most airlines so the only sounds you will hear are your heartbeat and the waves splashing against the shore. Adventure seekers can also hike from Davis Bay to the nearby Annaly Bay Tide Pools. If you get hungry, you can always run up to the hotel for a bite to eat or a cold drink. To get to Davis Bay, head to the north shore. If you are staying at Carambola Beach Resort you are already there! If you are coming from Christiansted, drive west along Centerline Road and turn right on route 721 (just after the University of the Virgin Islands and Research and Technology Park). If you are coming from Frederiksted, drive east along Centerline Road and turn left on Route 721 (just after the Department of Agriculture). When you get to the end of Route 721, turn left on Midland Road (Route 69). Continue to the end of Midland Road (about a mile) and turn right onto River Road. Drive to the end of River Road. River Road has numerous twists and turns so drive with care. At the end of River Road turn left. Continue about a half mile and you will see the entrance to Carambola Beach Resort. Park behind the security guard booth and take the steps down to the beach. When you make it to Davis Bay, take a picture or two and share it with us on our Facebook page. Contact Us if you need a ride! We set out to offer tips and information designed to help readers enjoy and explore St. Croix. We always recommend that you obey all local laws, know your limits, explore responsibly and have as much fun as possible on our lovely island of St. Croix! Centerline Car Rentals is St. Croix’s largest locally-owned, independent car rental agency. Of course, we recommend you keep it local when selecting your vehicle for your excursion. Reserve your car online at Centerline Car Rentals and choose from our diverse cars, minivans, trucks, and jeeps for rent and determine your pick up location. We’ll be there, guaranteed. So are you ready to start your road trip? Have a safe trip and remember, keep left. History comes alive when you walk through the grounds of Estate Whim Plantation and the St. George Village Botanical Garden. At one point St. Croix was home to more than 250 plantations or estates and for 200 years the island was dedicated to the production of sugar. Drive around the island today and you can find ruins of these old plantations. You will also find a few plantation watchhouses. These small 8′ x 10′ structures no longer exist on St. Thomas and St. John so you only find them on St. Croix. There are a number of restored, mostly private, plantations including Sprat Hall, the oldest planation on St. Croix, Butler Bay, Estate Little Princess, Estate Mount Washington, Estate Whim, and Estate St. George. Until the middle of the 20th century most of the plantations fell into disuse and dense tropical vegetation began to reclaim much of the properties and buildings. In 1954 St. Croix Museum Inc. began an eight year project to restore Estate Whim plantation and in 1972 the St. Croix Garden Club received the first parcel of land for what has become the St. George Village Botanical Garden. Estate Whim Museum, located on 12 acres in Estate Whim, includes an 18th century neoclassical great house, slave quarters, factory, and a fully restored windmill. The stately Great House has an immaculate collection of sturdy mahogany furniture and hand-carved mahogany artwork. The original plantation covered more than 1400 acres and was divided in the 1920s when the Federal government bought the land for a homestead plan. Whim is the oldest sugar plantation museum in the Virgin Islands and the museum continues to actively collect and conserve artifacts pertinent to St. Croix’s colonial and modern history. The research library houses a superb collection of books, manuscripts, maps, photographs and archival materials that document Crucian and Virgin Islands culture and history. If your ancestors lived in St. Croix, the museum just might have some information about them. Estate St. George, better known as the St. George Village Botanical Garden, is a 16.5 acre garden planted among the restored buildings and ruins of an 18th and 19th century sugar cane plantation. The site overlaps a 23 acre Amerindian site that was settled around 100 A.D. Today the botanical garden is home to 1500 native and exotic species and varieties of plants. It is the perfect place to learn about the natural beauty of the Virgin Islands. The museum at St. George Village chronicles the 2,000 year history of Estate St. George. Both facilities are available for weddings and other special events and the lush tropical settings are ideal backdrops for what will surely be a memorable experience. You can find both locations along Centerline Road on the western half of St. Croix. Thank you to everyone who participated in the 2014 Centerline Car Rentals Wish You Were Here? Photo Contest! Richard Rossi for his lovely rainbow over Protestant Cay image! Thank you Richard for your entry. We hope you enjoy your winnings. Look for Richard’s image in next month’s Wish You Were Here? feature!! Green Cay National Wildlife Refuge – Wish You Were Here? We love the tranquil beauty of Green Cay National Wildlife Refuge. Because of the fragile eco system – it is home to one of only two significant populations of the St. Croix Ground Lizard – the island itself is closed to the public. While no one is allow on the island, kayaking and snorkeling around the island offers adventure and beauty for all ages. Most often we head out from Green Cay Marina. Tamarind Reef Beach Resort rents kayaks at the Beach Shack – say hi to Mimi and tell her we sent you! The trip across from the marina entrance is easier if you head out on light wind, calm sea day, but if you are more experienced in a kayak and up for a little workout the trip is manageable most any day. Once you leave the marina entrance you will want to point your kayak northeast – toward Buck Island. If you are planning to circumnavigate the island, this route takes you upswell and upwind first. That ensures you hit the most challenging portion of the trip first, while you are still fresh. Then, work your way around the island and enjoy the scenery. Some think the rock formations on the northern side of the island are reminiscent of the ancient Easter Island statues – just in shape alone though. You be the judge. If you are feeling a little Cousteau and you would like to explore the snorkeling around the island – it is gorgeous. We do recommend discussing that with the folks at Tamarind Reef Beach Shack. The water conditions and your individual experience are key to developing a snorkel plan that best suits your needs. We have circumnavigated the island by snorkel many times and the views include amazing underwater rock formations, huge sea fans and heaps of discarded conch shells. Again, your individual aptitude and the prevailing sea conditions can make or break this expedition, so do check in with the experts at Tamarind Reef Beach Shack. That’s exactly what happened in Salt River Bay in November 1493. But that fateful meeting between Columbus’ sailors and the Taino indigenous war party at Columbus Landing, was far from the beginning of the history of the Salt River Bay National Historical Park and Ecological Preserve. “Every major period of human habitation in the Virgin Islands is represented: several South American Indian cultures, the 1493 encounter with Columbus, Spanish extermination of the Caribs, attempts at colonization by a succession of European nations, and enslaved West Africans and their descendants. More than a dozen major archeological investigations since 1880, together with historical research, reveal this remarkable story. Few places engage the imagination so completely, drawing visitors into the spirit of the place and its beauty and sanctity.” — according to the US National Park Service website for the St. Croix park. Today, Salt River serves visitors and locals alike as an entry point to the Caribbean sea for fishing, kayaking and oceanic exploration. The area is home to the Virgin Islands most well-known “bio bay” locations. Kayak tour operators like Caribbean Adventure Tours lead amazing guided kayak tours day and night. The evening tours feature the bio bay – where millions of tiny organisms light up underwater as your kayak glides atop. To get there from Christiansted, follow the Northside Road (Rte 75) West to Sidney Lee Road/Northshore Road (Rte 80) and turn right. Follow Rte 80 until you see a marina on your right, turn right and the marina and Caribbean Adventure Tours are inside the marina on the right or you can proceed to Columbus Landing and the National Park Service visitor Center by proceeding straight past the marina entrance. Note: the National Park Service Visitor Center is open part of the year by appointment only. Explore the online information before setting out on your historical adventure! If you have a chance to view Christiansted town from the harbor, don’t miss it! The lovely row of pastel buildings lining the newly redone boardwalk is simply Gorgeous. The Old World charm carries back through town as small roads and brick alleyways meander up the hillside. Once a playground for the likes of John Wayne and Maureen O’Hara and recently a holiday stop for Martha Stewart, Seth Green and Vice President Joe Biden. Christiansted town’s eastern waterfront is graced by a well-preserved collection of historic Danish buildings including Fort Christiansvaern and the Steeple building. All managed now by the US National Park Service, these pieces of history offer wonderful insight to St. Croix’s colonial past to visitors and residents. Definitely a walking town, you can stroll from the Fort (Free Parking until 4:30 pm) into the main business district. There you will find stunning art work in the numerous galleries, quaint restaurants tucked into 18th century brick courtyards and clothing shops offering everything from simple island styles to haute couture. As you make your way through town, remember it is customary to greet people throughout the island with “Good Morning” or Good Afternoon.” This sign of respect for the Crucian culture is always appreciated by residents and vendors throughout Christiansted as well. Don’t miss a stroll along the Christiansted boardwalk. Dotted restaurants and SCUBA diving operators in action, there is always plenty to do and see along that walkway. Watch for Seaplanes taking off and landing and check out the tarpon in the shallow harbor waters while you grab a leisurely lunch. Or, enjoy the harbor lights and moonrise as you dine, surrounded by Danish Caribbean history. Out Christiansted location also rents vehicles year-round at the western end of the Christiansted boardwalk – right by the seaplane dock. Throughout the year a variety of activities light up Christiansted including: Movies at the Fort, Jazz at the Fort, Christiansted Restaurant & Retail Association Jump Ups, Art Thursdays and the Christmas Boat Parade to name a few. This special town offers a perfect backdrop to any outing. Explore it your way when you visit St. Croix next!